Counting the time it spent as a segment on The Tracey Ullman Show, The Simpsons has been a part of the Fox lineup for nearly 30 years. Think about that. When Matt Groening and company started, Reagan was still in office, and most of today’s pop stars were not yet born. As radical and forward-thinking as the show was, it’s still a product of the late ’80s. So it’s understandable that self-aware nostalgia has crept into Simpsons memes. A perfect example is “Simpsonwave,” a surprisingly popular and prolific genre of YouTube videos in which digitally altered clips from vintage Simpsons episodes are synced to blippy, blissed-out vaporwave music. 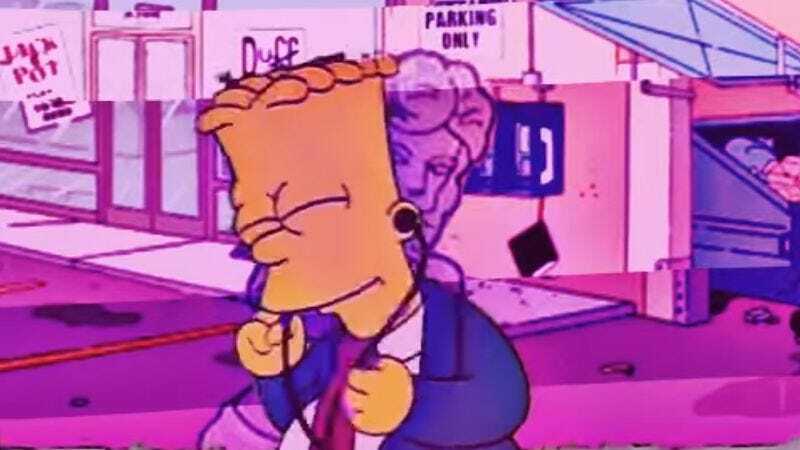 Since vaporwave self-consciously evokes the synthpop of the past as a mockery of popular music in general, it makes a very apt soundtrack for old-school Simpsons clips. The animation itself is often given a purplish tint, and glitchy VHS-style distortion effects are added to the footage. The results are trippy and transportive but also oddly soothing and even beautiful. Here’s a representative example entitled “Thrillhouse.” The music is by Owen Dennis, but the action is all Millhouse. In this moody video, somewhat reminiscent of the movie Drive, it’s recess everywhere but in his heart. Another such clip, “Sunday School,” puts the focus on Bart. The aesthetic is very similar: More purple-tinted Simpsons footage, more vaguely retro-sounding synth music, in this case heavily sampling “The Message,” a genuine 1982 hit for Grandmaster Flash And The Furious Five. More videotape-style distortion. The educational web series This Exists recently devoted an entire eight-and-a-half-minute episode to exploring the Simpsonwave phenomenon. Host Sam Sutherland attempts to determine whether the meme is just another random, meaningless internet joke or if there is some deeper significance to it. After all, the videos can provoke a surprisingly emotional and sincere response from viewers. Perhaps it’s the combination of The Simpsons with vaporwave. “There’s something to be said,” Sutherland suggests, “about a new emotional resonance being added to a genre of music that I would argue exists specifically to mock the commercial and corporate vibe of mall-type music.” Even Sutherland admits he may be overreaching here, but it’s difficult to deny that Simpsonwave videos have a hypnotic power, especially if you watch, like, 20 of them in a row. Right, Lisa?